As a kid, I loved riding my bike. My friends and I peddled for miles. Our neighborhood had plenty of streets with virtually no thru traffic. Road safety was easy – just pull into someone’s driveway whenever a car come along. We didn’t have to bike to school and most of us had dusk curfews. We rarely rode at night or on busy roadways. But, what if your child does have to peddle home on more heavily trafficked roads or after sunset? You could buy your child one of those old-fashioned, reflective safety vests like those worn by school crossing guards. They even have models with LED lights on them. But, let’s face it, they are no fun and certainly not cool. How long do you think it will be before your child “loses” their oh-so-fashionable safety vest? And, besides, it probably wouldn’t fit over a full back-pack anyway. The good news is that you can light up your child’s world with cool, flashing and easily seen bike safety lights. In this post, we’ll talk about the different types of lights you can attach to your child’s bike that make them safer while upping the bling factor. In another post, we’ll also talk about fun lighting that your kids can wear or hang from their backpacks and helmets. Many competitive bicyclists live in my area. They expect drivers to share the road with them but often do not make that easy. Sharing the roads around here can be a challenge, even during the day. At night, we’re also likely to encounter deer, rabbits, squirrels, dogs, cats, foxes, opossums, raccoons and even bears on the road. One night, we even encountered an injured baby owl in the middle of the road. I’ve lost count of how many times I spotted an unlit cyclist only because I thought they were a deer or other critter in the road. How lucky we both were that I spotted them in the darkness. Sadly, some of those cyclists did have tail lights. But, they were either low on batteries or malfunctioning so badly as to be useless. Others were hidden by clothing, backpacks and even the seat of the bicycle. If you read nothing else in this post, please follow this checklist before buying safety lights for bikes. Always have extra batteries on hand. Make sure your bike safety lights will not be obscured by clothing, backpacks or other parts of the bike. Consider using at least two different types of lights to ensure visibility from all 4 sides. Only buy lighting that you know your child will use. Make sure the lighting can be properly installed on your child’s particular bike. Solar lights sound like a great idea but should only be used along with a secondary power source or additional battery-powered lighting. Blue head or tail lights are a no-no; they are only permitted on police vehicles. It shouldn’t come as a surprise that there are plenty of great options for head and tail lighting for bikes. Along with the addition of more efficient LED lights, manufacturers are making headlights with multiple lights that can fully light up roadways. There are even a few models with laser lights that create a virtual lane for cyclists by ‘painting’ lines on either side of the cyclist. Prices and reviews are all over the map; shop carefully. And, just remember, no blue lights and position the lights in a slightly downward position to avoid blinding approaching drivers. Another option is to create your own headlights and taillights. There’s various clamps designed to attach flashlights to bikes but zip ties would probably work too. There are a number of different colors and styles of lights available that attach to the valve cap of bicycle tires. While they certainly provide the cool factor when peddling, since they are a single light, they may not make the bike visible from the front and back. They may also not be as visible when the bike is stationary. Unfortunately, we’ve seen some complaints about valve lights not fitting over the valves of some bikes. Some of the valve style lights have motion detectors that may turn the lights on and off – a great battery saving feature, but, maybe a risky one if there are places along the route where you child will have extended waits for traffic or stop lights. Quality seems to run the gamut with these type of lights. Check out the reviews carefully. Negative reviews can relate to the lights not fitting properly or they could mean that the lights are of a low quality and are unreliable. We think the AOR Power Multicolor Bicycle Tire Valve Stem LED Cap Lights are a good choice. 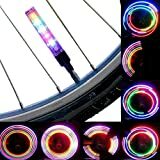 The 5 LED Bike Wheel LEDs are activated by the wheels when they are in motion. Again, styles, prices and ease of use vary; but, overall people seem pleased with this style of bike safety lights. Individual lights hang on the spokes like reflectors. We saw some complaints about these falling off but some families simply used zip ties to secure the lights. The zip ties may also make it more difficult for someone to steal the lights off of your child’s bike. These lights look a lot like reflectors during the day and may not be as much of a target for thieves as some of the fancier bike light options. Folks seem to like the 4-piece set made by Oumers. It includes on blue, one red, one green and one multi-colored light. Powered by--Each light uses CR2032 lithium battery (included) and one extra. A great Christmas present for your children!! From all of our research, it seems these offer the most visibility and bling for the buck. Bike light tubes and strings are LED lights much like the lights used in some Christmas lights. The good ones are waterproof and come in a variety of different colors. Brightz, Ltd. is one of the more popular manufacturers of LED bike light tubes. Be cool! Be Seen! 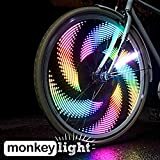 Wheel Brightz use 7 feet of 20 Micro LED lights to create a ring of brilliant color as they automatically rotate thorugh 8 unique colors. 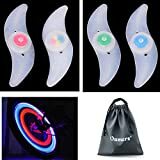 Make your wheels glow with a circle of spinning light! Be careful to read the reviews before buying the light tubes as some of the offerings have thin wires that won’t stand up to rough use or getting wet. These are among the coolest of the cool bike safety lights. When the wheels spin, the lights create designs and patterns using the concept of “persistence of vision.” Persistence of vision or POV is just a fancy way of saying the lights create an optical illusion. If you wave a flash light back and forth it looks like it is leaving a trail of light. It’s not. That’s the illusion part; our eyes think they’re still seeing the light all along the path it is traveling. It’s the same concept that makes drawn cartoons appear animated. Speed is a factor in creating the visual illusion and ensuring the patterns will be recognizable. One manufacturer suggests cyclists will will have to peddle between 10 and 12 mph for the patterns to display properly. Considering the average speed most people walk, at least according to Wikipedia, is 3.1 mph; I suspect most kids easily can peddle in that range. Cyclists going slower speeds are still well-illuminated, they just won’t be generating the patterns. These bike lights usually include a central unit that houses the batteries and the control system with lights that get placed along the spokes of the wheels. They are programmable and therefore may involve a slight learning curve on changing the patterns. However, it sounds like the bling factor is certainly worth the investment of time. BRIGHT AND COLORFUL: The M232 has the brightest LEDs for any wheel light in its class. EASY TO USE: One button allows you to choose between off, dashed, and solid lines. Cycle between all of the color options with the other button - solid colors, stripes, gradients and rainbows. BUILT TO LAST: Rugged and waterproof LEDs, these lights are built to last. They come with a 2-year limited warranty. MAKES A GREAT GIFT: Perfect for any woman, man, or child who rides a bike. Or a great cycling gift for yourself!